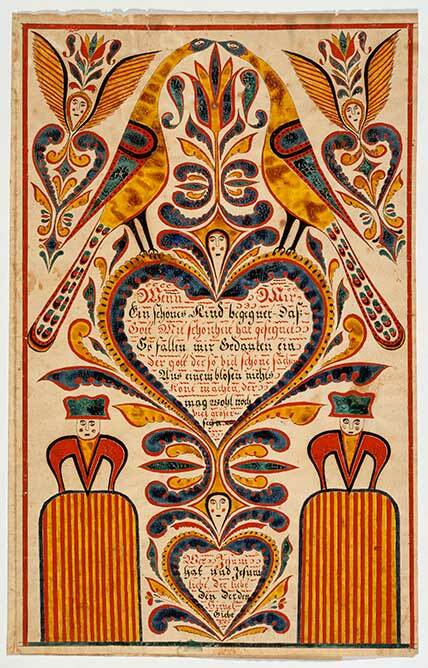 No one form of folk art from Germanic Europe was the model for what scholars classify as fraktur. Although the term gained currency in the field of American folk art following its adoption by Henry Mercer in 1897, its use is recorded in Pennsylvania much earlier. Originally a reference to a style of ornate “broken” lettering, fraktur today encompasses a wonderful variety of illuminated texts. Some forms appear to be almost exclusively American: Vorschriften, or writing samplers, penmanship example booklets, tunebooks, bookplates, Liebesbriefe, or love letters, house blessings, presentation frakturs, and rewards of merit. The most frequently encountered form is the birth record, called Daafschein in Pennsylvania’s German dialect. This is true in spite of the fact that the largest number of printed examples are labeled Geburts- und Taufschein, or birth and baptismal certificate, and the overwhelming majority of them contain the date and details of a person’s birth but not similar information about the baptism. The Taufwunsch, typically a godparent’s greeting, however, has clear Continental roots in what is called a Goettelbrief in the Palatinate and a Patenbrief in standard German. These records are usually addressed to the child by his or her baptismal sponsors—the persons who spoke on his or her behalf in the sacramental rite—and they frequently give only the child’s first name have a rather limited design vocabulary, and were often wrapped around a coin given by the sponsors to their godchild. In contrast to American examples, gottelbrief and patenbrief sometimes refer to a Pfarrkirche, or parish church, a concept not used in Pennsylvania Protestantism. They are also often folded into a small unit, whereas American versions commonly were rolled for safekeeping, which accounts for the appearance of names written on the margins of the backs of the documents. What was a quasi-religious souvenir of the Christian sacrament of initiation in Europe became essentially a record-keeping document in America. It was thus already a secular document, even with scriptural and hymn texts about baptism. Patently religious designs on American examples are not only highly uncommon, they are replaced by openly secular elements and treated to an immense range of artistic whimsy. The impact of printed taufscheine on others done later by hand, as well as on other types of fraktur, dare not be minimized. A personal authentication of one’s existence, they are found pasted inside the lid of the chest of each family member owned to house personal possessions. They were submitted as proof of birth with applications for military pensions. And—to the horror of collectors ever since—they were rolled up and placed in the right hand of their owner before burial, as had been done in Alsace if not elsewhere on the Continent. Taufscheine were mass-produced on printing presses beginning in the 1780s, and printers who dated their editions, such as those in Hanover or Allentown, sometimes needed several reprints in one year and, at the least, a new edition every year because of their popularity. By the end of the 1800s, religious printing houses restored the records with emblems of piety, issued examples in English, German, Scandinavian, and other languages, and sold them to clergy to give as a record of the event. This Pennsylvania German folk custom became a widespread national custom and not only among German groups. Thus it joined these peoples’ other contributions to American life, from Groundhog Day and the Easter rabbit to Christmas cookies and Christmas trees. 1. See a reprint of William M. Fahnestock’s “An Historical Sketch of Ephrata; together with a Concise Account of the Seventh Day Baptist Society of Pennsylvania” (1835), in Felix Reichmann and Eugene E. Doll, “Ephrata as Seen by Contemporaries,” The Pennsylvania German Folklore Society 17 (1952): 164–86. Source: Stacy C. Hollander, American Radiance: The Ralph Esmerian Gift to the American Folk Art Museum (New York: Harry N. Abrams in association with American Folk Art Museum, 2001), 473.